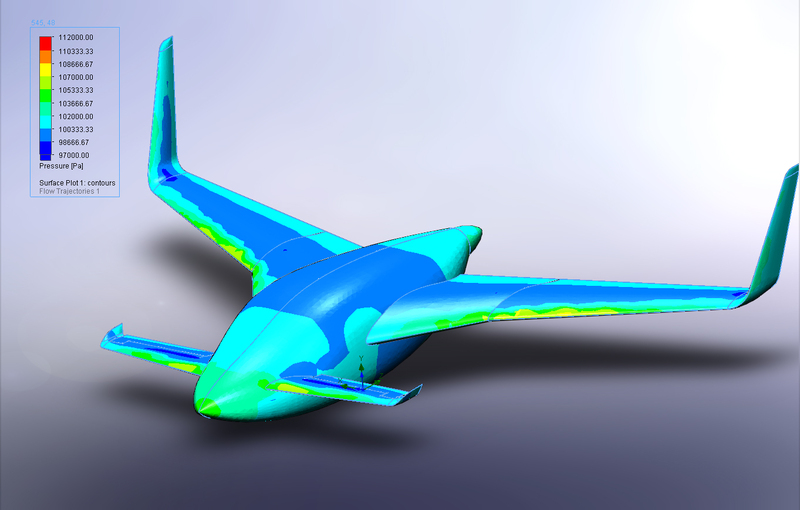 Extensive air flow analysis has been made to minimize drag and maximize performance. 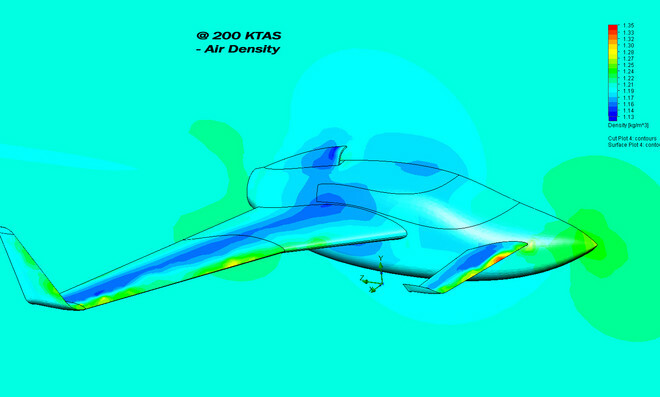 This flow shows the aircraft level at a 200 knot airspeed. The orange and yellow colors represent the velocity of the air directly over the center of the aircraft and relative to the motion of the aircraft. 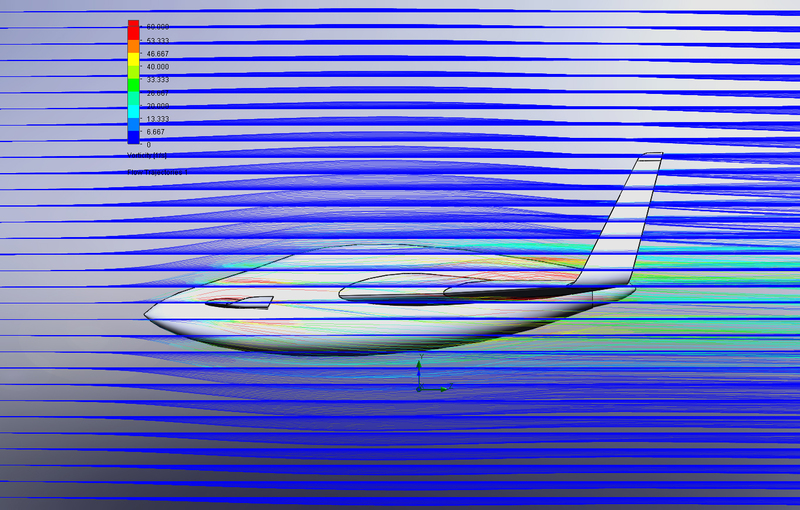 As you can see, the air flowing over the roof is accelerated due to the foil shape of the fuselage. At the nose and tail the air is slowed somewhat. 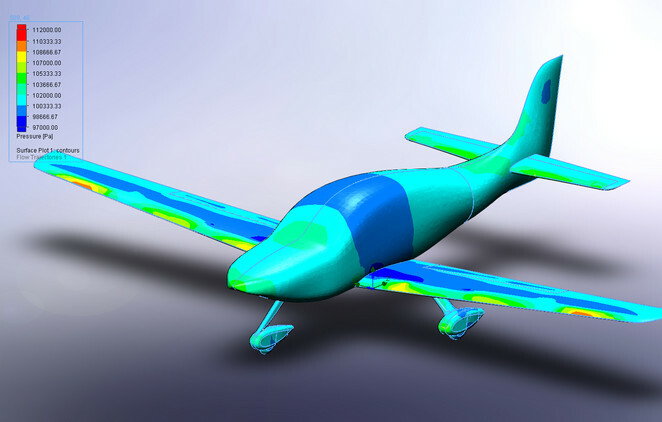 The blue/green colors on the fuselage represent the relative air pressure. 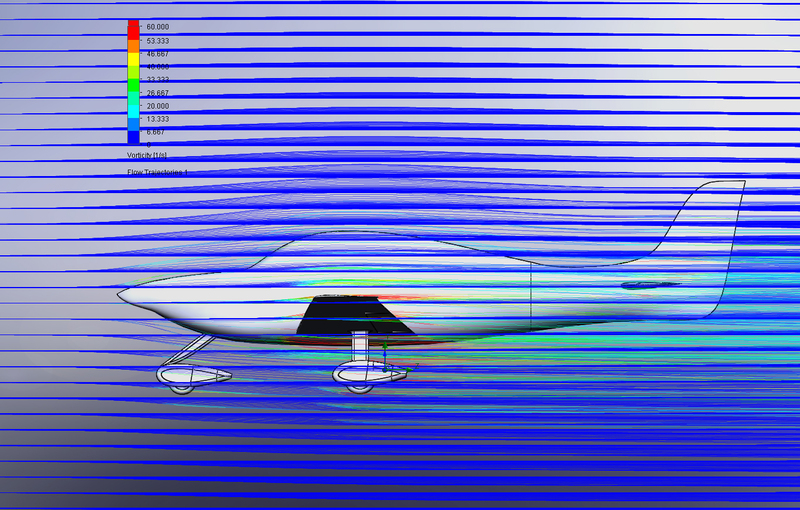 As you can see, there is low pressure on the top of the main wing, canard and fuselage. The advantage of the wider fuselage is that it is creating a substantial amount of lift thereby allowing the overall wing area to be reduced which in turn reduces drag. 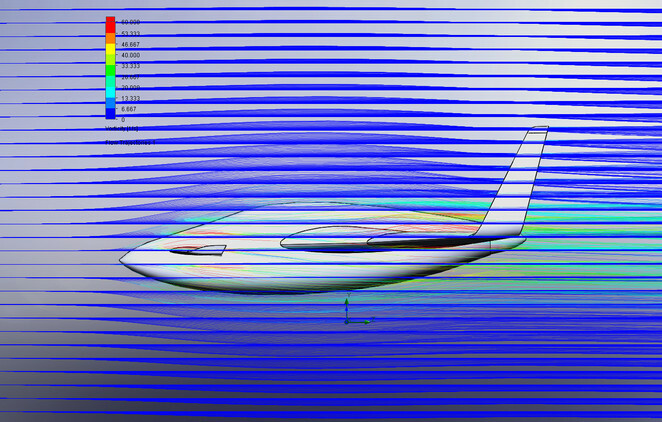 This image shows the vorticity on each part of the airframe. 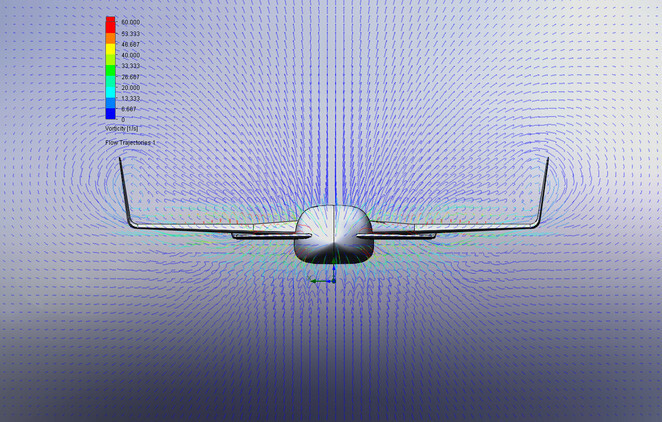 The sleek shape minimizes turbulence further reducing drag. A small amount of disturbance can be see around the canard root. There is slightly more disturbance around the intake that we hope to reduce with further tweaking. It is far better however than the earlier designs with the intake slightly elevated from the fuselage. This plot shows air pressure around the airframe and the colors on the airframe indicate shear stresses. As you can see, the sleek shape eliminates stress points. This plot shows the air density distribution around the airframe. 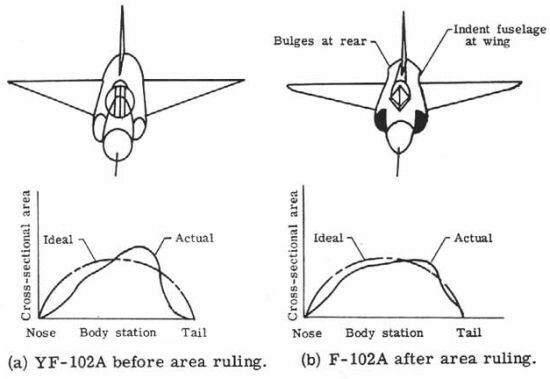 Although first discovered by a German, in the 50's a bright NACA engineer independently discovered the Area Rule and it was later used on the F102. 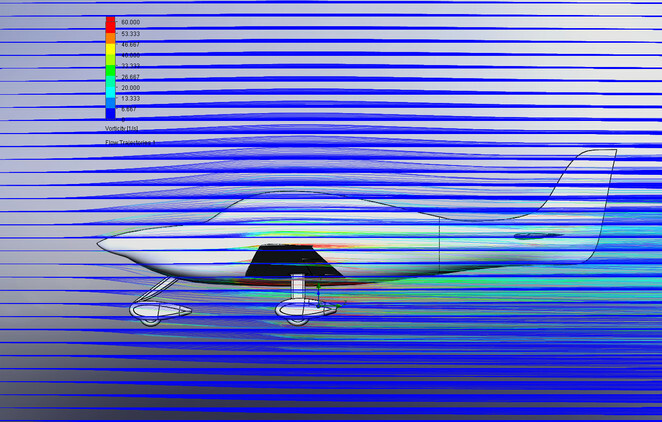 Before the changes the aircraft was not able to go supersonic and afterwards it readily made Mach 1.2. They modified the fuselage so it was thinner at the wings and slightly larger at the rear. It gave it what was soon known as a coke bottle shape. That's a performance gain close to 30%. To read more about the Area Rule click here http://en.wikipedia.org/wiki/Area_rule. 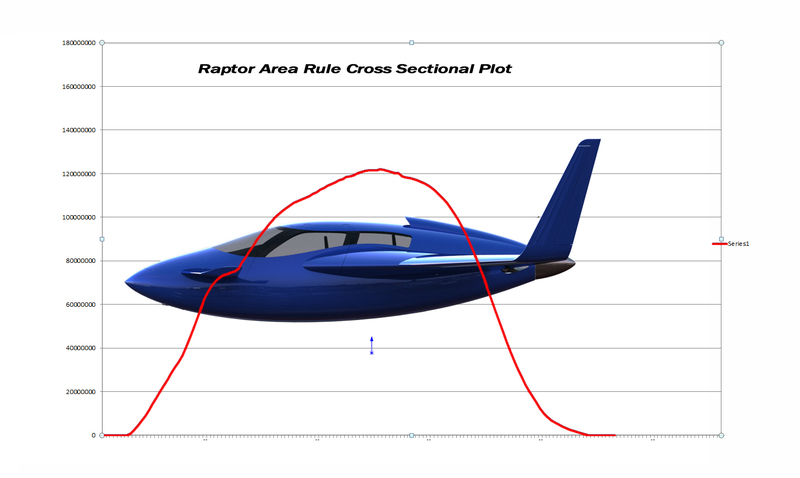 As you can see from this chart that overlays the cross sectional area over the airframe profile the design of the Raptor results in almost a perfect area rule distribution. This means that instead of having pressure fluctuations as the air moves around the aircraft the pressure instead increases smoothly and decreases smoothly. This minimizes any turbulence and further reduces drag. With a conventional tractor design there is a big jump in cross sectional area where the cockpit and wing begin and likewise a large drop where they end. Then you have another increase and decrease on the tail section. 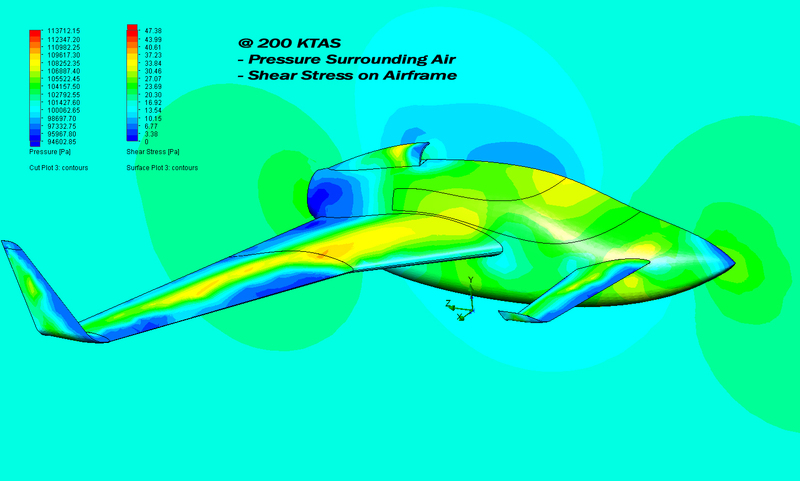 These abrupt cross sectional area increases and decreases on conventional aircraft create large pressure fluctuations which disrupt air flow creating turbulence and therefore create a lot of drag. This new design virtually eliminates this problem. Compare the area Rule distribution of the Raptor with this one of the Cirrus SR22. As you can see there is an obvious problem with this design. The widest part of the cockpit is in the same longitudinal position as the wing. This results in a maximum cross sectional area that is 33% larger (160 vs. 120 in the chart) than the Raptor. 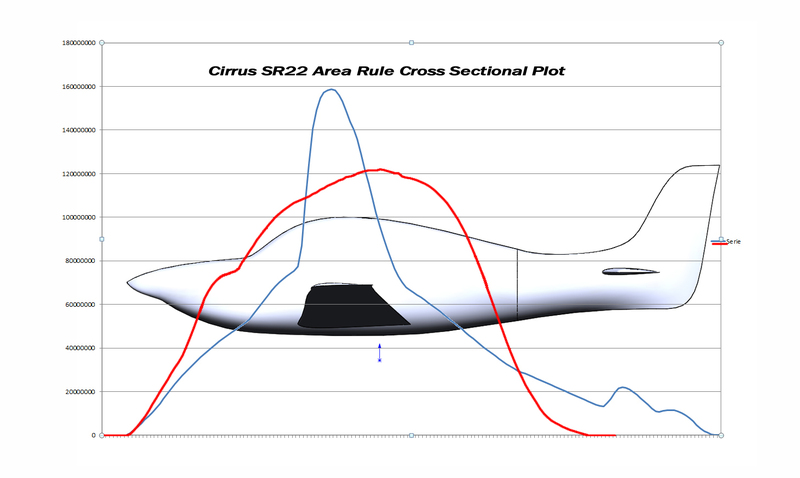 So even though the Raptor has a wider cabin than the SR22 it's maximum cross sectional area is way less meaning it can squeeze through the air without having to displace as much air as the SR22 does. This makes for a much faster and more efficient design. 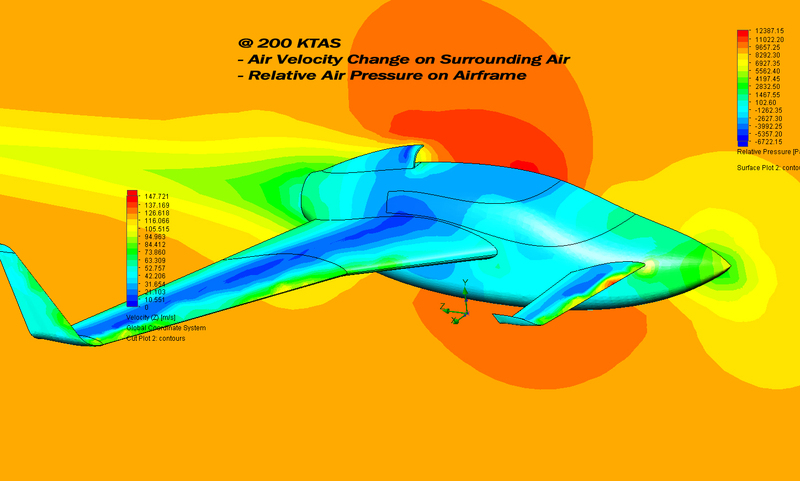 Pressure distribution on the airframe at 175 kias. Notice that there are no areas of high pressure due to the smooth cross sectional area transitions that the Area Rule analysis provided. The Cirrus has areas of high pressure on the wing leading edges. This is because the cross sectional area of the cabin increases right when the wing comes into play and also because the wing has a straight leading edge. These areas are directly responsible for unwanted drag. Side view shows the vorticity or turbulence as air passes around the airframe. This is also at 175 kias. 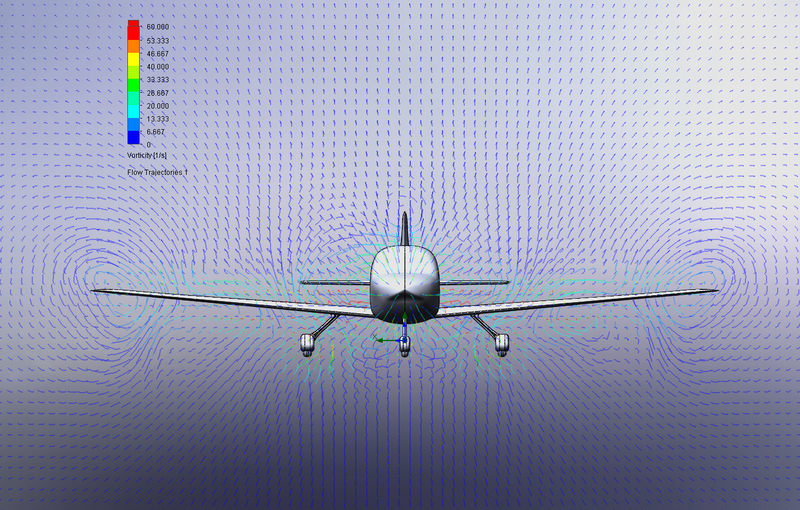 Cirrus shows turbulence over the wing and around the landing gear. 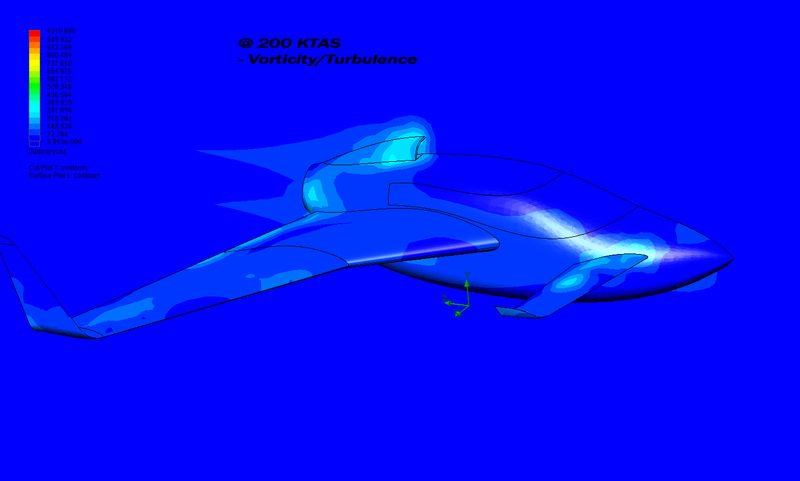 At 175 kias the vorticity around the airframe is acceptable and the wing tip vortices are reduced and moved to the winglets. The Cirrus shows vorticity around the landing gear as well as large wing tip vortexes that contribute to drag. 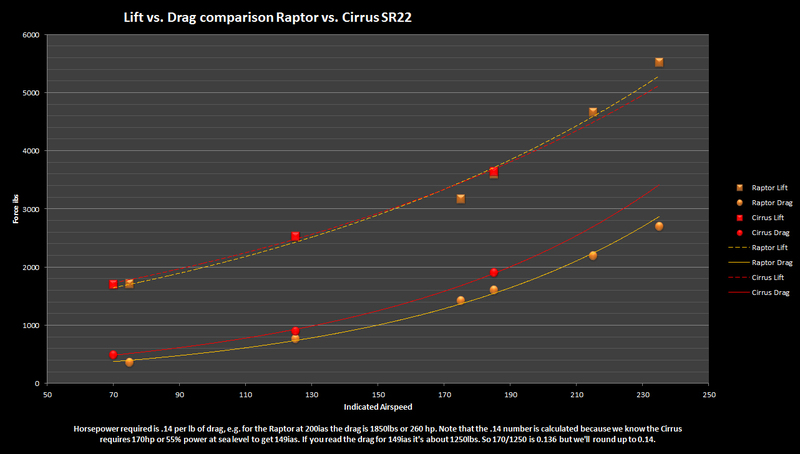 The drag comparison shows a fairly even 15% reduction in drag on the Raptor when compared with the Cirrus SR22. Knowing the performance numbers of the Cirrus we can readily estimate the performance of the Raptor airframe for any given horsepower. Watch the video below for a detailed explanation of how, with 300hp, the Raptor should be able to achieve 300 ktas at 25K feet.